In early January, we decided to take a girls trip to Disney. We all have big life events happening this year, so we wanted to take time to celebrate. Since this trip was a little spur of the moment, we wanted to do it in the most affordable way possible. We flew down on Southwest for $100 and my friends flew back on Allegiant for $100 so our flights were pretty great. Tip for booking flights: check out prices on Tuesdays because that’s the best day to book. Below, I’m diving in to the details on where we stayed, what we did, and where we ate during our time at Disney World. I always love staying on the Disney grounds to fully submerse myself in the magic, but hotels on the grounds can get pricey. You likely won’t be in your room all that much anyway so if you don’t want to go overboard on price per night, I highly recommend Disney’s All-Star Music Resort. As is typical Disney fashion, the music resort goes over the top with different buildings based on various music styles and décor throughout the lobby highlighting musical moments. We stayed in the country fair section and the room was nice. I mean, it was your basic hotel room and served all our needs. If you have family or friends that like to have extra space, you may want to think about upgrading to a suite because the rooms are mostly beds. We arrived around 8:30am so we checked our luggage and headed to the guitar shaped pool, mimosa in hand. Our room was ready around 1pm and our luggage was delivered to our room. All of the hotels on the Disney grounds have shuttles that run roughly every 10-20 minutes to get you to and from the parks and Disney Springs. The Magical Express can also take you to and from the airport if you’re flying out of Orlando (MCO), but you’ll need to arrange that before your trip. You can also check your baggage to your airline when you’re heading home which worked out well for me because I had a nighttime flight and didn’t want to go back to the hotel because, well, that would have cut into park time. Our hotel also had a café with plenty of food options for anytime of day including gluten free Mickey shaped waffles (best ever). Disney is so good about food allergies which I appreciate. This hotel was a great, relatively affordable option especially for just the few nights we were there and it was around $200 per night. Other places I’ve stayed: Port Orleans Riverside, Yacht Club, Fort Wilderness, and The Grand Floridian. I just stayed at Port Orleans Riverside in October 2018 and honestly, aside from the décor, the rooms were relatively similar to All-Star Music as far as size. Disney has the best food options and maybe I also feel that way because they cater so well to gluten free (I mean Mickey freaking waffles guys) and other allergies. The biggest piece of advice I can give you is to make a reservation if you plan to eat dinner at Disney Springs or Magic Kingdom. If you’re looking for a character dining experience, that needs to be booked months in advance. We grabbed breakfast each morning at the hotel café because that was just the easiest thing to do. The rest of our meals were pre-planned or places we found in the parks. Below are my recommendations for food at Disney. The Edison at Disney Springs – This 1920s styled restaurant has delicious salads, appetizers, and the coolest cocktails. Enzo’s Hideaway at Disney Springs – This one is actually connected to The Edison in Disney Springs, but it’s kind of hidden. It has a cool speakeasy vibe and the most delicious Italian food. Liberty Tree Tavern at Magic Kingdom – We booked our trip about two months out, which in Disney terms, is last minute. This was one of the last dining reservations for the time we wanted. When you’re visiting Magic Kingdom, you have to plan meal times around the parades and fireworks show. However, for the price we paid, this was worth every penny. It was a Thanksgiving style meal, we paid $35 per person, and it was fabulous. Epcot World Showcase – Epcot is my favorite park next to Magic Kingdom. The World Showcase is a great place to eat because you can basically sample authentic foods from around the world (or drink around the world which I’ve done twice). Dole Whip- You can find this in Magic Kingdom at Aloha Isle in Frontierland near the Pirates of the Caribbean ride. Mickey Pretzels- These can be found throughout the parks, but I know for certain they are in Magic Kingdom in Liberty Square. Macaroons in France in the World Showcase at Epcot. No matter who you are or why you’re going, you need to plan your trip. I don’t mean every minute of every day, but you’ll want to know which parks you plan to visit each day. If you want to do all four parks, you can do it in two days (check out this post). Book your fast passes as soon as you can (you get access 30 days out from the start of your trip). You can only book 3 per day in one park and you can’t get more until you use all 3 passes. Download the Disney app. The app allows you to make meal reservations, book fast passes, see wait times, and so much more. If you’ve never been to Disney, I suggest spending at least three days in the parks. The park hopper ticket is so great because you can go to any park at any time. It is a bit more expensive to do this, but a good option for those that want to do some exploring. You have to go through security each time you enter the parks so just be prepared to take your bag apart. If you’re staying on the grounds, take advantage of Extra Magic Hours at the parks. For Magic Kingdom, make sure that you plan your visit on a day that the firework show will be happening because they don’t do it every night. If you really want to get in the spirit of Disney, you’re going to need some Mickey ears. Check out these Etsy stores for my favorites: HERE, HERE, HERE. If you’re trying to do a Disney trip very cost effectively, take your own snacks and water to the parks. Disney is one of my favorite places in the world. It’s the one place I feel like I can be a kid again and forget all my worries. I’ve included videos below from previous trips just so you can check it out and start planning your own Disney Girls trip! 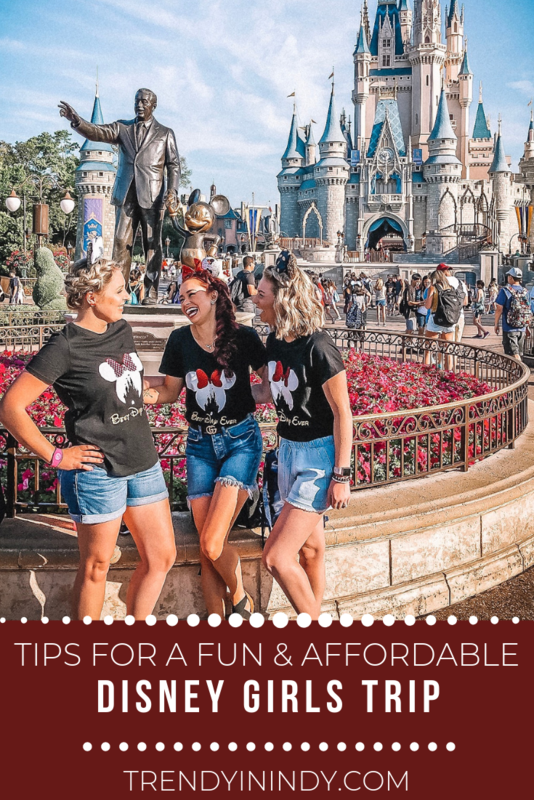 PS: Loving these tips for your next Disney Girls Trip? Click here now for my guide to do Disney in 2 days!